At 523 square feet it is a potential replacement for those nasty FEMA Trailers. It was the same size as a FEMA emergency trailer, looks better and, while its initial cost was more than a small FEMA trailer, its advantages over the mid- and long-term were obvious given FEMA's track record of maintaining and disposing of their emergency trailers. 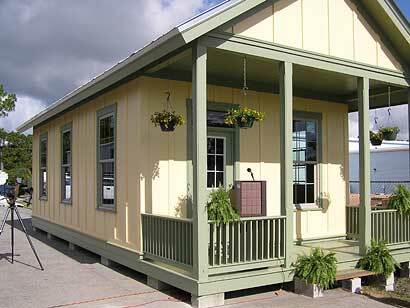 pre-manufactured cottages. Photo by Samantha Bearden. What began as a conceptual drawing for emergency housing by New York designer Marianne Cusato has grown into a series of designs that make affordability beautiful. The many variations and possible uses for the flexible Katrina Cottages are getting noticed, says Cusato, who has fielded calls from Kansas City, Kan., (officials there want to use them as homeless shelters) to as far away as Ghana. 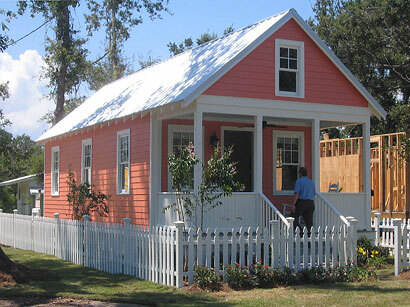 A separate series of Katrina Cottages are being developed for the private-sector market. For Cusato, the Katrina Cottage is part of a larger vision to "take back the word 'affordable,' and remove the taboo associated with it. We shouldn't think less of anyone because of where they live, and they shouldn't think less of themselves. I think it's fully within our ability to change that." Gary Delise, a resident of Arabi in New Orleans' St. Bernard Parish whose family lost their house and is now living in a FEMA trailer, says a Katrina Cottage would "beat a trailer by a long shot." He told Baton Rouge Advocate reporter Joe Gyan, "I think it would be a nice replacement. Not only a nice replacement, but a start to another house. If I could rebuild, that's what I would do. I'd like to have the house demolished and put this on it." The history of the Katrina Cottage. 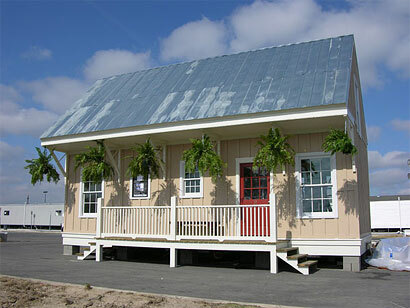 Here's a slideshow showing the construction of a typical Katrina Cottage. Safer... cheaper... can become an actual home... why didn't Congress change FEMA's "no permanent structures" rule to allow these things long ago? 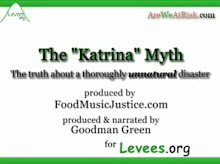 Here's another site with info about Katrina Cottages from a bunch of different sources. Pretty helpful info, much thanks for the article.